We’re back with another amazing giveaway! 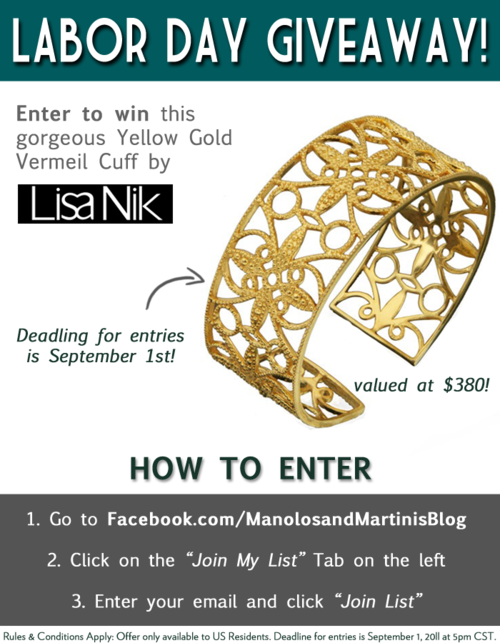 We’ve paired up with local but internationally renowned jeweler, Lisa Nik – she’s donating her popular Yellow Gold Vermeil Cuff (retail value $380) to one lucky Manolos and Martinis reader! If you aren’t on Facebook, comment on this post with your email address to be entered into the giveaway! Deadline for entries is September 1st, 2011 at 5pm CST. The winner will be chosen randomly using Random.org and will be announced Friday September 2nd! We will contact the winner via the email address provided. Good luck!